Private phone companies are making a pretty penny by nickel-and-diming prison inmates and their families, sometimes to the tune of $2 a minute for in-state phone calls. Yet the exorbitant fees keep taxpayers from footing the bill. 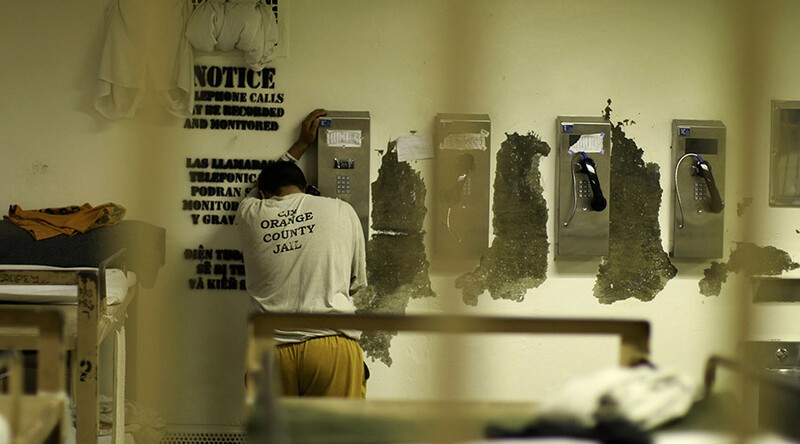 The prison phone industry has been booming since the 1990s. It’s grown to a $1.2 billion-a-year industry dominated by a few private companies, as people made some 500 million calls totaling more than six billion minutes both to and from prisons and jails in 2014 alone, the New York Times reported. RT’s Lindsay France called Global Tel*Link (GTL), which contracts with Los Angeles County, to set up an account to call a fictional friend at the Twin Towers Correctional Facility. On top of those fees, France learned that there was no way to determine the per-minute rate of a call until it had been made and paid for. Anthony Graves spent 18 years on death row accused of a crime for which he was later exonerated. He struggled to maintain communication with his support network at home by phone. Graves isn’t alone in paying such a high price to keep in touch. The Prison Policy Initiative reported that a call from California’s La Verne City Jail to an in-state number requires a connection fee of $12.59 and a per-minute charge of $1.15, amounting to nearly $30 for a 15-minute call. After a decade of complaints from prison-rights groups and families of inmates, the Federal Communications Commission (FCC) is slowly attempting to rein in the telecom companies. In August 2013, the FCC instituted interim requirements for interstate long-distance calls, capping rates at $0.21 per minute for debit and pre-paid calls and $0.25 per minute for collect calls. A revised version of the rules went into effect last February. Typical commercial rates ‒ those not involving the prison system ‒ cost a mere $0.04 per minute, according to the NY Times. The same month that the FCC rules went into effect, Securus Technologies and GTL both offered incentive-laden contracts to one Georgia county, France reported. Securus offered a little over a million-dollar signing bonus for a five-year contract with 110 free tablet computers thrown in, while GTL proposed $1.5 million upfront for a seven-year deal and threw in 150 tablets. In October, the FCC opened up comments on “a comprehensive, market-based approach to achieving just, fair and reasonable rates for all inmate calling – local, in-state long-distance and out-of-state long distance.” It is also looking at banning so-called “site commissions,” which are payments that prisons demand of the inmate calling service providers and are often used by prisons to pay for services and facilities not related to the cost of hosting calling services. The agency is also seeking to impose permanent rate caps on all of those services, replacing the current, interim ones. Prison phone call providers are fighting the FCC’s rules, saying that the rate caps have forced them to lose money on those calls. “We think some of the new rates are below our cost,” Richard Smith, president and CEO of Dallas-based Securus, told Time last February. He said his company handles 120 million calls per year at an average rate of $3.50 per call, and that, while some inmates may have paid $17 per call, those cases were “outliers” made by inmates he believed were pushing an agenda. “This is a public policy issue,” Smith added, noting that vendors like Securus will end up paying prisons less in site commissions, which totaled $460 million in 2013 ‒ money that cash-strapped facilities will have to make up elsewhere. “Taxes are going to go up,” he said. Prisoner advocates argue, however, that there’s another public-policy issue involved ‒ that of recidivism.